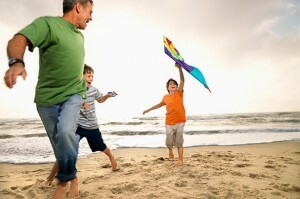 The summer is often reserved for family vacations and interactive activities for kids. However, it can be a challenge to come up with new and exciting things for your children to do all summer long. Here are a few suggestions for surviving the summer season so that you and your kids will thoroughly enjoy this time of year. Teach your children about the nutritional value of food and the growth process of plants by growing a garden this summer. Plants like basil, blueberries and cantaloupe are ideal. Not only is this a great seasonal activity, it can help your child not to be such a picky eater. When children have a hand in making their own food, they are more likely to at least try the food before rejecting it. Seeing the finished product of tasty fruits and vegetables can bring about a sense of fulfillment that your children will carry with them throughout the year. Chances are you don’t want your child to spend all summer playing video games. To prompt your son/daughter to get off the couch and into some fresh air, by selling their used video games. Make a deal with your child to engage in one outdoor activity for each video game sold. For instance, one game could be worth a 20-minute basketball game; 2-3 games sold at a time could be the trade-off for a sprinkler part in the backyard. This is a creative way to ensure your child stays active over the summer while spending some quality time with him/her. Have a car wash in your neighborhood to help your child make some extra money this summer. You can even invite some other kids in the neighborhood to participate in this summer activity. Serve healthy summer snacks like tropical fruit and Italian ice that is low in sugar at the car wash to make the day even more fun and help your child decide how he/she will spend the earnings from the car wash. For instance, the money could go toward another summer activity like visiting a local museum or water park, or your child could use the funds to buy school clothes and supplies for the upcoming year. Few things are more delicious and refreshing than homemade ice cream or popsicles. Preparing food with your child helps to strengthen your bond. Creating summer treats in a variety of flavors also helps your child to associate the summer season with tasty flavors and even better company. Summer is also one of the best seasons for camping. If you’re not able to travel to your favorite campsite this season, you can easily set up a campground in the backyard. Pitch a spacious tent and bring lightweight blankets inside to stay cool during summer evenings. Bring your laptop to the tent so you and your child(ren) can watch your favorite movies during the campout and create a small fire in the backyard so you can roast foods like hot dogs and summer fruits for your campout. A stay-cation can be just as fun as a traditional summer vacation away from home. Book a reservation at a local fancy hotel, and take advantage of the amenities. For instance, take your daughter to the hotel spa for a day of pampering with you, or bring your son to the hotel’s pool for a day of fun activities in the water. Even though you’re not far from home, the change of scenery could be a welcome change for your family so you can create even more fun summer memories. Incorporating one or more of these activities into your summer routine can teach your children responsibility while allowing them to create memories they’ll remember for summers to come. Making the summer extra special can also turn into a family tradition that will make the season both productive and enjoyable for the whole family.